We often marvel at comics and the silver screen for depicting cape-wearing heroes who save the world with super human strength and extraordinary powers. 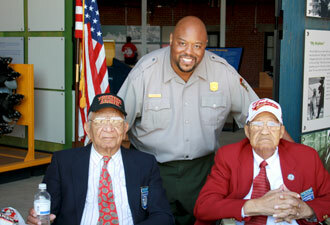 The Tuskegee Airmen, dressed with integrity, character and courage, are the real thing. The Tuskegee Airmen National Historic Site, established in 1998 at Moton Field in Tuskegee, Alabama, tells the stories of the Tuskegee Airmen and their heroic actions during World War II. The military selected Tuskegee to train pilots because of its commitment to aeronautical training and its local climate conducive to year-round flying. Moton Field was the place where young African-American men learned to fly, to become pilots and officers, and ultimately make history. From this training ground, one of the most highly respected all African-American fighter groups of World War II emerged—despite segregation and prejudice. Also known as the “Red Tails,” the Tuskegee Airmen, together with the men and women who supported them, cleared the path for full integration of the U.S. military. Join us for a visit. Your indoor and outdoor exploration spans over 41 acres, including several historic structures, cultural landscapes, and exhibits. Upon arrival, a scenic overlook offers a panoramic view of the entire historical core. This area is perfect to relax, reflect, walk, or enjoy lunch. As you make your way to the property's core, you'll find strategically placed exhibits to help guide you as you explore the park at you own pace. The core consists of framed replicas of the Cadet House, an Army supply building, and the physical plant/engineer's office. Other standing structures include two airplane hangars, the Skyway Club, an auxiliary storage shed, the bath and locker house, and a warehouse/vehicle storage building. Hangar No.1, completed in 1941, was the center of operations. 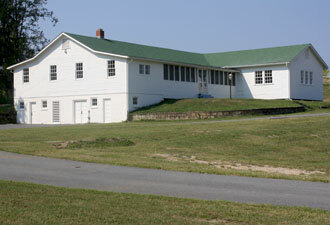 Along its perimeter were briefing rooms, administrative offices and maintenance shops. Today, the space contains two main visitor areas, an orientation room and museum. As you enter the orientation room, you'll find knowledgeable staff who can answer many of your questions. A four-minute video introduces viewers to the Tuskegee Airmen. 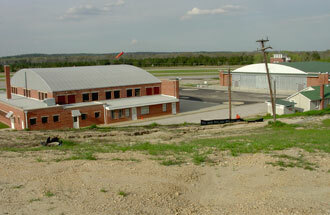 The museum area houses replicas of two World War II era training aircraft. The room is filled with re-creations and period furnishings of maintenance operations, as well as the sights and sounds of 1940s Moton Field. Hangar No. 2, completed in 1944 in response to expanding operations, was designed to include the control tower and parachute packing area. After renovation, the building will reopen in late 2013. It will offer contemporary exhibits that focus on the broader story of the Tuskegee Airmen. Visitors will find additional artifacts, a feature film, and oral histories of several pilots. Whenever you visit, you'll find park staff who can answer questions and enhance your experience. You'll leave with a better understanding of these heroes—these warriors of the skies who fought for freedom and equality at home and aboard. Prepare to be inspired. Come fly with us, no cape required.